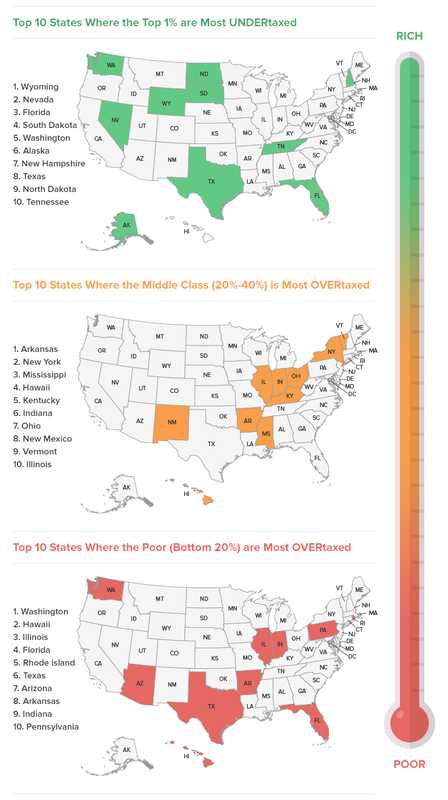 • The middle class is most overtaxed in Arkansas, New York and Mississippi. • Most Americans think “fair” state and local tax systems impose higher taxes on higher-income households than on lower-income households. • Conservatives and liberals generally agree on what a “fair” tax system looks like. However, conservatives are more supportive of slightly higher taxes on the poor and lower taxes on the wealthy. • Current state and local tax systems are, on average, extremely unfair. While most Americans — liberals and conservatives — think a progressive tax system is most fair, virtually every state has regressive state and local tax structures. A table showing select additional data from the study can be found below these graphics.